Every morning my three-year-old daughter and I watch the bus go by and every morning my daughter asks the same question, “Mama can I go to school today?” Immediately my heart drops because I know she’s not going to like my answer, “No, hunny, not today.” I quickly reply and divert her attention to something else. After many similar mornings which usually include a three-year-old style tantrum, I decided, it’s time for school. As soon as we made the decision, we found a school, we visited and just like that she was enrolled. Actually, her first day is tomorrow and wouldn’t you know I’ve changed my mind about the whole thing. I think it’s due to the flashback of my first day, of first grade. I clearly remember boarding the big, yellow cheese wagon (school bus) and sitting in the second seat on the left. Unknown to myself, this was not my seat. As soon as my legs hit the stiff plastic bench I was greeted by a punch to the stomach. Tears immediately were brought to my eyes but the overall feeling was confusion. There was no one sitting there, why couldn’t I? I’ll never forget as the older boy’s blue eyes bobbed out of his head as he yelled at me. His disheveled blonde hair that sat too high on his head, sat stiffly, which reminded me of a helmet. But perhaps I was experiencing hair distortion from the tears pooling in my eyes. Either way, a rush of emotions has been swirling inside of me since we’ve made the decision to send her off to school. Even though she will be attending pre-school for a few short hours two times a week, I can’t help but think of all the encounters she may have that will leave her as confused as I was on that bus ride. Back then I can’t even remember if I told my mom what happened. I do remember the bus driver pulling over and coming to my rescue. She did pull him to the front seat and did her fair share of yelling. All I really remember was that I shouldn’t sit in that seat, ever again and trust me I didn’t. I can’t help but wonder what experiences my daughter will have during her first week at pre-school. I hope it’s nothing as quite as disturbing as my first week. I just have to remember that these encounters help mold us into the people we become. I just have to hope that my daughter will be molded without experiencing a physical altercation on her first day. In search of his place in the world, Kyn visits his new friend, Ben’hyamene. Together, they meet an ailing dragon rider from the marshes of a land called the Carr. The rider recounts a people beset by anger, depression, and despair. After befriending and healing the rider, the group travels to the rider’s home. There they discover a breed of wild dragons, called drakes, which have been at war with humans for four hundred years. One sleepless night, Ben’hyamene uses his new abilities to communicate with the lead drake. This sets Kyn and Ben’hyamene on a path that could bring peace to a conflict that’s nearly destroyed a whole people. Can revenge be set aside and enemies be called friends? Find out in the exciting third book of the Dragon Courage series, Dragon’s Revenge by Kandi J Wyatt. Kandi is a wife, mom of five, teacher, artist and author. In her free time, she enjoys writing fantasy, writing Christmas programs, drawing using graphite and colored pencils. Portraits are her specialty. She also enjoys photography. Thank you to her photographer husband who has let her join his journey in photography as well. She is both his model and apprentice. (She still think he does a better job than her.) On occasion she’s his assistant when working with clients and when he needs a “light stand with feet”. If you’re a fellow educator and have experienced this phenomenon, I feel for you. This has to be the most trying part of my day. 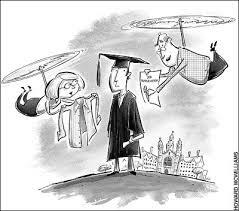 As an online educator, my contact with a student is primarily through emails and face to face online. However, I spend more time fielding emails and phone calls from parents. First and foremost, I want to state that I believe it’s important that parents take an active role in their child’s education, but there has to be a limit. I cringe every time my phone, or other device, indicates a new email or voicemail. Not because I fear it’s a student looking for me, no, I fear it’s a parent asking me questions about their child’s course. What can (insert name here) do to raise his/her grade? Why did (insert name here) get number 2 wrong on the quiz? Can (insert name here) have an extension? I also receive panicked voicemails asking me to call them immediately regarding their child’s grade or status in the course. Did I mention sometimes these calls come in well before 8:00 in the morning? Perhaps at this point you don’t think these examples are a problem. However, when the parent is contacting me for their seventeen or eighteen-year-old, I become infuriated. Why on earth are parents more interested in my course? Why are they asking me these questions and their children aren’t? So, I decided to do some research and what I’ve found is startling. 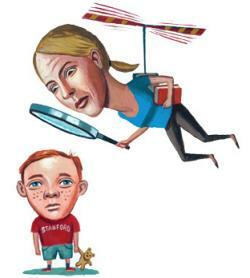 According to Parents magazine, parents hover over their children for a number of reasons. Some of the reasons include fear of dire consequences, feelings of anxiety, and overcompensation as well as peer pressure from other parents. This caught me by surprise because my first instinct was always to attribute the parent’s behavior from a child requesting the interaction. This, however, may not be true. A parent may suffer from anxiety over things they can’t control so they try to establish control over their child’s schooling or other activities. Perhaps some parents exhibit this behavior because other parents they associate with do. For whatever reason, this behavior can negatively affect their child. These helicopter parents can inflict more damage than good, even though their intentions are pure. I’m not sure what I can do, other than insisting on speaking with the student directly. This may even be a the new parenting, model. I say this because when speaking with my friends, who work in a variety of fields, experience coworkers who act younger than their actual age. One friend even shared a story where their coworker’s parent called him in sick. Yes, that’s right a twenty-something-year-olds parent called him in sick. I am nervous that this is becoming the new norm and I fear that more and more students will exhibit these traits. As an educator, I fear for these students and their futures. I also fear that I may lose my sanity as the educator who speaks to more parents than students. A little over two years ago I began writing Deceit. I found myself at work, newly pregnant and completely sidetracked. I was having vivid dreams of a place that was so enticing and realistic. I found myself daydreaming, which is not an odd occurrence, but it was just more frequent than I was used to. The only problem was I couldn’t shut it off. One day after school (I’m a teacher) I sat at my desk and after everyone went home I started writing my first young adult fictional novel. I can’t remember a time where I wasn’t writing something. I have always loved to escape into a good book or into my own creative, whimsical adventure. I knew that writing was in my blood and after ignoring it for a few years I’m happy to say, I’m back and I’m not stopping! Since I began writing Deceit a lot has changed. I now have a two-year old and a one month old. I am still teaching Biology and Forensic Science but I now am an online instructor and work from home. So things at home are busy and I use my “writing time” as an escape from my very happy, hectic life.